Rebecca Minkoff and BagTrends.com want you to THINK PINK and SHOP PINK. So, we teamed up to create this pink clutch in patent crocco leather, a SHOPBagTrends.com EXCLUSIVE. 75% of sales from each clutch will be donated to the Susan G. Komen Breast Cancer Foundation (http://www.komen.org/). This fabuluos pink crocco patent leather bag will retail for $115 - EXCLUSIVELY at www.SHOPBagTrends.com. And we only have a handful to go around! So DO GOOD and SHOP PINK!! The clutch officialy goes on sale next Tuesday. I'm sure by now everyone in NY knows that HandM "has 5th avenue covered!" tha nks to it's newest location on 42nd and 5th - which is such a great spot right next to the library and my bus stop to get home!! Any who, before the doors officially opened yesterday at 12pm a private breakfast was held. I thought there was going to be some kind of presentation, but actually it was just drinks and breakfast that you could carry around while you shop. I loved it! It was total VIP which is so fabulous. It was nice bumping into editors I have worked with in the past and finally meeting the pr people from HandM. But, I have to say the best part was shopping in peace and quite with a drink in my hand. Oh ya, and getting to shop at 25% off! Very bag-a-licious. Speaking of bags, HandM is really working the faux leather. I was very impressed with the selection of work bags. For $30-60 you get a decent bag that may not last past the season but if you really want to catch a trend this is the way to do it. While I'm always on the hunt for the next rising star in the bag world, sometimes I can't help but marvel at the glory of the great. 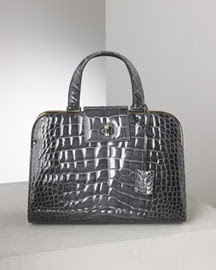 Case in point - YSL's latest version of the Uptown Bag in patent grey crocodile. Proving yet again that Stefano Pilato and Valerie Herman (YSL's CEO) are a match made in fashion heaven. The gradual color change from whites blue to grey is fabulous. The structured, boxy shape is divine and a perfect pairing the must-have dress coat for fall. The damage? $26,995 Oh, and there's a wait list which, if my sources at SAKS are correct will be filled before the bags ever get to shelves. Meaning? The bags will never hit the shelves. Oh, to be a bagistas with endless cash supply. But, fear not my bag-a-licious friends. There are lots of grey and/or structured options out there for all our wallets, regardless of size. IMG Fashion, the producer of Mercedes-Benz Fashion Week, announced today that it has reached an agreement with the city of New York and the Parks Department for the twice yearly event to remain in Bryant Park through February 2010. It is the longest term contract ever signed by IMG with Bryant Park. BagTrends.com was mentioned in Women's Wear Daily - the fashion bible for the fashion industry. I'm so excited. What a great way to kick off New York Fashion Week. Other fabulous sites mentioned: The Budget Fashionista and Bag Snob. Halle Berry confirmed to Access Hollywood her happy baby news on Tuesday. Congrats Halle! And congrats on your fabulous silver YSL bag. You fellow mommy-to-be Selma Hayek and current mommy Demi Moore who all made the same bag-a-licious choice!